It may seem like a lot to consider, but looking at these factors will help ensure you choose the best housing option for you as you study abroad. A popular choice for many university students is college dormitories (also known as dorms or residence halls). Many universities offer students accommodation on-campus, often sharing rooms, or living spaces – such as bathrooms and kitchens. Because bathrooms are often shared amongst an entire floor, many residence halls have single gender floors. It can be a competitive process to gain a place in on-campus housing as they are highly sought after. It’s an easy option, as most students living there are experiencing their first year at the university and looking to meet new friends, all utilities are provided in the overall cost of rent, and they are close to all of your classes. However, if you’re a graduate student or want more space for yourself, other options might be a better fit for you. 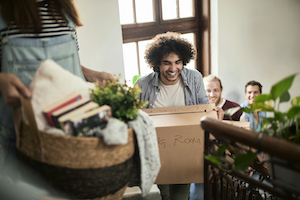 Many colleges and universities allow study abroad students to move into resident halls for their first few days of arrival during orientation and decide if they will stay or find alternative housing. Contact your school to see if this is the case! There are many houses and apartments near universities abroad that cater to the needs of students. Landlords around schools understand their market and sometimes even provide furnished accommodations with individual student rooms. Rental prices typically do not account for utilities so it’s important to check prior to signing a lease. One of the benefits of renting a room in a house or apartment while studying abroad is that students can find an option that provides them with as much or little privacy as desired. When renting a room or apartment off-campus ensure you use a reliable company that verifies their rentals. One place to start your search is with HousingAnywhere. Universities often work with local families to provide accommodations to study abroad students- whether short term or long term. Families with a spare room in their house often rent it out to students. This can be a good option for international students, as it can help battle homesickness and allows students to be fully emerged in the culture. Contact your university for recommendations if this is an option you would like to consider. Your lease is the contract that allows you to rent your housing. Typically, on-campus housing will have a lease period by semester or academic year while off-campus housing will have an annual lease. In some cases, land lords will allow renters to rent for shorter time periods but still require the commitment of a few months. Knowing the length of your lease is important as you want to make sure you will have somewhere to live the entire time you’re studying abroad, but won’t be paying rent while not living there. Keep in mind that breaking a lease often comes with a fee- find out what that fee is and if it would still apply in the event you have to urgently return to your home country. When searching for housing while studying abroad it’s important to consider how easy it is to get to and from campus from the places you’re considering. Can you walk or bike, or will you have to take public transportation? If you must take public transportation you will need to factor in the additional time and money. Another factor to consider is if being further from campus will deter you from spending time on campus for extracurricular activities, or even class. Additionally, look at businesses around where you’re considering living. If key businesses like grocery stores and a post office are not nearby you will want to ensure there is access to public transportation or another work around. A big decision you will need to make is if you will have roommates. Whether you’re sharing a room, apartment or house, it’s important that you are prepared to live with other students and lose some of the privacy you might be used to. There are often online university boards to connect students with other international students or other people in your same degree program, so you can get to know people before you start the academic year and find a potential roommate if needed. If you decide to live with roommates that you don’t know, try to contact them before moving in to introduce yourself and manage your expectations early on. Don’t forget to check whether the area you’re interested in is safe. You will want to feel secure in your surroundings whether lounging at home or walking alone. You can gather accommodation location suggestions by contacting student guidance or searching for previous student experiences online. Thinking about your priorities early on will help you have a better college experience. Now that you have an idea what to look for, where do you start looking? It’s important to rely on a trusted source that not only caters to study abroad students and their needs, but that also takes physical and financial safety into account. When starting on your search to find study abroad accommodations you will want to start with your university. Universities typically have a dedicated section of their website for on-campus student accommodation that includes pricing, photos, rental duration and other important details. If you’re looking for off-campus accommodations universities can also direct you to common, safe areas around campus that students choose to live in. If you’re planning to rent off-campus accommodation, one of the easiest ways to find housing while studying abroad is through HousingAnywhere. Their simple search engine allows you to search for different accommodations in numerous cities across the world. It is designed with international students in mind and has partnerships with universities across the globe.